Department, BTC. BTC, Kokrajhar has released total 60 vacancies through Walk in Interview. Eligible candidates can attend Walk in Interview with the original documents for the desired posts. Candidates must have age limit between 18 years to 43 years. Candidate should appear for Walk in Interview with their own cost. Walk in Interview for Kokrajhar BTC Recruitment will be held at CSB Office, DLR Building, Kokrajhar on the dates 4th, 5th, 6th, 7th, 8th & 11th December-2017. 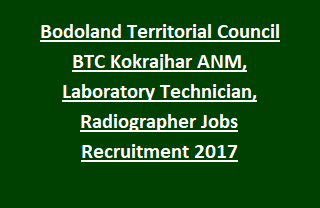 For more details of Eligibility Criteria, Application Procedure, Age limits, Selection Process, Walk in Interview Dates & Time regarding CSB, Bodoland Territorial Council BTC, Kokrajhar Recruitment Laboratory Technician, ANM, Radiographer Vacancies are mentioned below. There are total 60 posts are going to fill through this CSB, Bodoland Territorial Council BTC, Kokrajhar Recruitment Walk in Interview 2017. 2. Laboratory Technician: 13 posts. 3. Laboratory Assistant: 03 post. 5. Steno Typist: 01 post. Laboratory Technician: Must have passed HS in Science and Diploma in Laboratory Technician under Government Recognized Medical College & Health Institution. ANM: Must have passed HS in any stream and Diploma in ANM from recognized training institutions. Radiographer: HS passed and Diploma in Radiographer from govt recognized institutions. See the official notification for other qualification details. Minimum age limit is 18 years and maximum age limit is 43 years. Age relaxations applicable as per govt rules. CSB, Bodoland Territorial Council Kokrajhar will conduct walk in Interview to select candidates for the current recruitment. Walk in Interview dates: 4th, 5th, 6th, 7th, 8th & 11th December-2017 from 10.00 AM onwards. Eligible candidates have to bring all original documents related to educational qualifications, caste certificates, experience certificates, Photo identity card etc to appear for Walk in Interview. Date & Time of the Interview details are mentioned in the notification.